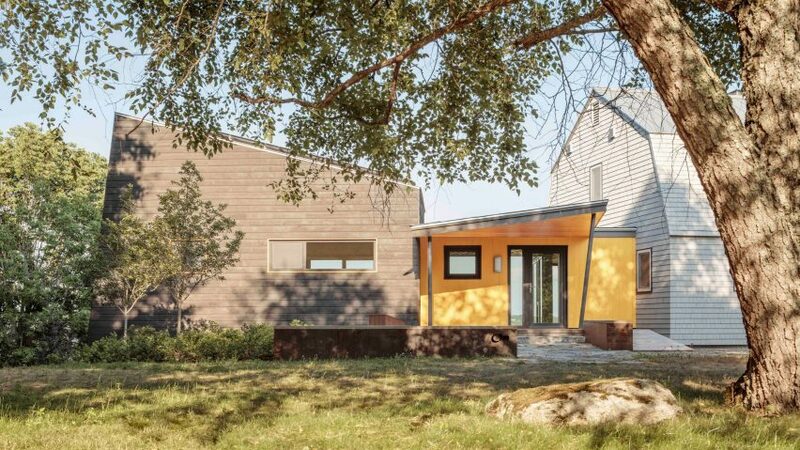 The contemporary extension that Kaplan Thompson Architects has added to a traditional home in Maine is linked to the original structure by a bright yellow volume. Originally built in the 1980s, the farmhouse-style New England home was in need of repairs. "The renovation needed to add vibrant character, more spaces that could take advantage of the expansive views, and energy efficient upgrades that would increase comfort and reduce operating expenses," said Kaplan Thompson Architects. 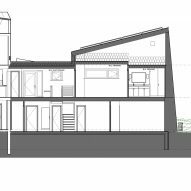 The two-storey extension adds two bedrooms to the home, named Cardamom and Almond, bringing the total to four. It also encompasses technical spaces and its own staircase. The extension's angular rooftop contains an array of photovoltaic panels, which – in conjunction with high levels of insulation – makes it a net-zero-energy construction. 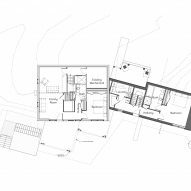 Because of the site's slope down to the waterfront, entrance to the 4,600-square-foot (427-square-metre) residence is on the middle level, between the existing home and the new addition. "A bold yellow connector serves as the new entryway, moving the home's emphasis to its welcoming doorway and away from the older wing of the house," said the firm, based in Portland, Maine. 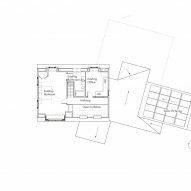 The reconfigured original volume now contains an open kitchen, living and dining room on the main level, with a den and guest bedroom on the floor below. The top storey contains a bedroom with its own ensuite. An opening in the floor allows residents to peer into the living room below, while bringing down more natural light. 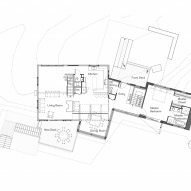 Located in the contemporary volume is the master bedroom on the middle level, and an additional guest bedroom below. 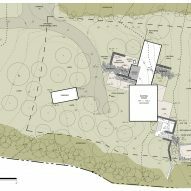 They are connected by a separate staircase from the rest of the house, making the extension a standalone unit. Its form was inspired by the pitched roof of the existing home, but designed to contrast it. "The bedroom wing manifests as an energetic, sculptural form, with an expanse of glass joining at angles, wrapping around the new dining room and reaching out and down the waterfront on the back side," said Kaplan Thompson Architects. Interior finishes were completed with a minimalist aesthetic. Features such as a dropped ceiling made of longitudinal planks and an original restored fireplace add touches of warmth. Other projects in the state of Maine include a home on stilts overlooking the Atlantic Ocean by Elliott + Elliott and a black wooden cabin built on the foundations of a defunct ranch by Carol A Wilson. Photography is by Irvin Serrano.